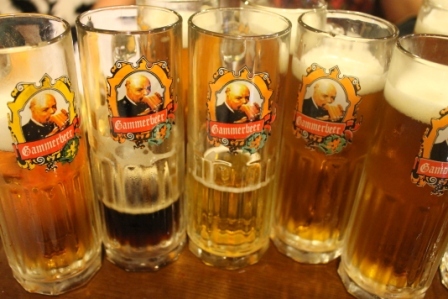 We started at Gammer beer brewery with tasting the first three beers for the evening. The style is Czech and the beers are quite light with surprisingly innovative name such as: Black, Gold and Golden. 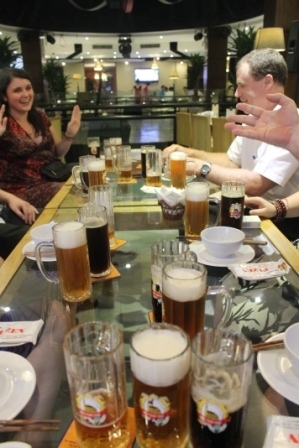 Beers in Vietnam has no particular name, they are normally named after their color. There are also one Gammer beer in Ho Chi Minh City. If you visit Gammer brewery between 9am and 10 am, you get one free for each beer you drink in the morning hours. 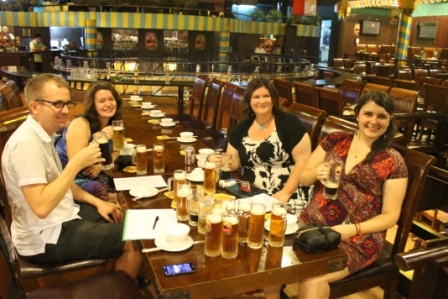 That’s the nice thing here in Hanoi, people appreciate beer at all times during the day! The Golden beer had better structure and taste than its two less structured brothers. The brewery tours is mostly on a normal day, if you come here a Friday or Saturday you can expect loud music and big crowds of thirsty hanoians. Next brewery was Hoavien brauhaus which never disappoints when it comes to taste and structure of the beer, service and environment. The staff speaks some English, are service minded and are dressed in happy yellow shirts which somehow feels very natural here. Their black beer is full bodied and tasty and the blond one is also one of the safe cards here in Hanoi. Down in the cooling room we had the luck to try fresh beer directly from the cooling tanks. 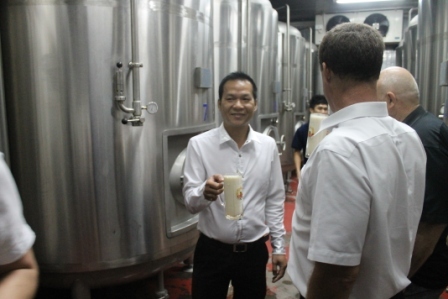 advanced and they take measurements every day to ensure perfect temperature and yeas process. We can call this place Plzen, bia tuoi tiep just means: Czech beer on tap. The brewery is quite big and you get surprised when you enter the quite small pub/restaurant which has place for about 100 people. Its still a mystery why there is a picture of a church at their beer glasses and why the brewery is looking like a café. It’s even more surprising when you see all the beer tanks filled with beer and realizes that they can produce huge amounts of beer, two or three times more than for example Hoavien or one of the Goldmalts. It’s a mystery where all beer is consumed. Plzen brewery We got a proper tour in the brewery and got to taste a glass of grapefruit smelling beer foam directly from the tank. According to the beer expert in the group, the grapefruit note comes from the typical Czech hops that they use. All three beers are of lighter style but good balanced and well worth the long way out to the brewery which is situated in Trung Hoa area, also known as Hanoi’s Korea town. After three beers at Plzen we went to Tay Ho to find a open place that serves good beer. 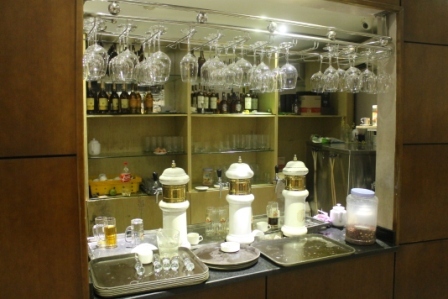 There are two restaurants in Tay Ho that serves beer from Goldmalt. 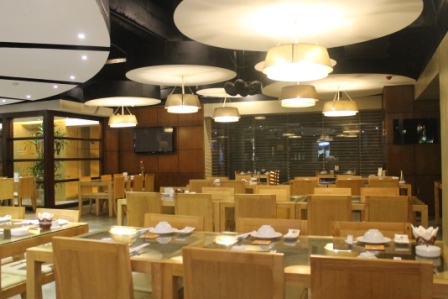 Daluwa restaurant and Budmo, both at To Ngoc Van street, serve both black and blond beer from Goldmalt. Hanoi is a early city and most places are shut down by 11 pm so we went to Ben Thuy resto which serves the blond German beer from Eresson brewery. 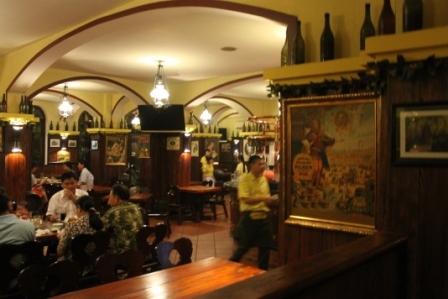 The place was closed when we came but service minded manager opened up the gates and offered us cold german styled beer. 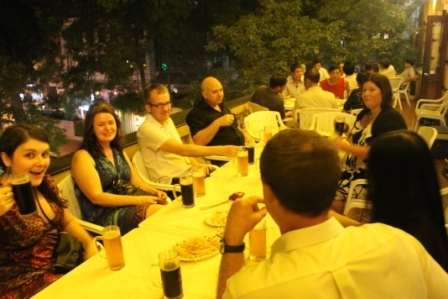 It was a good night and Hanoi never ends to suprorise. 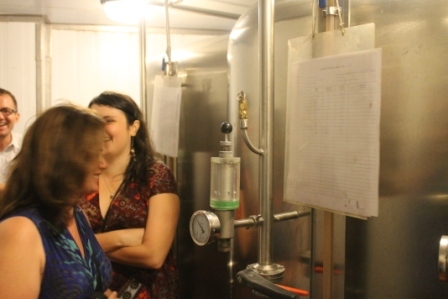 The next brewery tour will be on Thursday 17 Oct with visit to other breweries.